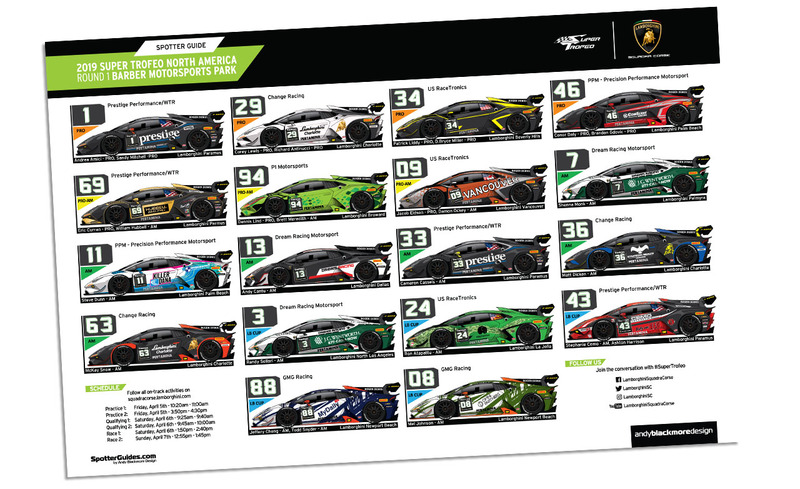 Welcome to the Official Spotter Guide for the 2019 Lamborghini Super Trofeo North America championship which gets underway this wekeend at Barber Motorsport Park in Alabama. The guides were commissioned by Lamborghini Squadra Corse, Streaming will be available on official site. These races are part of the Grand Prix of Alabama weekend at the circuit. I have produced an official guide for the Global Mazda MX-5 Cup which is available HERE. Indycar also have their own excellent Spotter Guide HERE. Thanks to Lamborghini for partnering with the European and North American guides again this year. If you get a few seconds, please thank Lamborghini Squadra Corse. Without their support, there would be no guide. NOTE: Please fill free to share the guide on Social Media, but PLEASE LINK TO THIS PAGE and not the guide (as file names change with updates) so your friends and fans can download the latest version of the guide! I can also track data easier which in turn helps my quest for sponsorship.